Congratulations mama on the birth of your baby/ babies and your journey as a mother. The post-natal period, after the birth of your baby is an incredible time like no other. A time for nurturing, healing and replenishing yourself, your baby and embracing this new phase of life with your family. Why do Post Natal Yoga? As a woman, the post natal period is a highly transformative time. It can be a time of creativity and vision, and also a time of great vulnerability. You have just grown and birthed a baby and thats amazing, inspiring, and astounding. At the same time everything can feel wide open, both in your emotional and physical body, as you get to know yourself, your baby and your body in this new time and space. Post natal women often talk about feeling highly sensitised to everything. Some describe it as a whirlwind where everything feels in flux. All of this is incredibly normal and so is the cocktail of emotions due to hormmal changes in the body. Your brain is literally growing when you are breast-feeding but women often feel there brain isn’t working properly. So do not fear mamas, it is not only working, it is evolving, just perhaps wired and tuned into a different frequency. Another thing which is not often spoken of, but is very common is a feeling of grief in the post natal period. Grieving for your old life, of what was, of not being totally familiar with who you are in this new context. Grief is part of the process needed to create space for the love, the ‘newness’ that comes with having a baby, as Naomi Stadlen says in What mothers do especially when it looks like nothing’, “in order to make enough space in her life for her baby, she seems to make a momentous inner shift… her whole self is changing..’ And in response to this something else that is heard so much is; ‘I need to get my old body back’. In essence there is no going back, but instead a beautiful opportunity to move forward and evolve. All of this is part of the post natal experience and it doesn’t need to all be peaches and cream’. Motherhood is messy, unpredictable, chaotic, and especially in the beginning, something which doesn’t sit well with rigid schedules, routines or time frames. Reframing what is often coined as mothering sacrifice, instead as a new maturity, no longer a self contained I, but a discovery of our innate power, strength, endurance and a surrendering to the change in order to move forward. A mama needs support and practical tools to help her navigate this new phase. Embracing a flexible and self compassionate attitude. Letting go of expectations, exploring and experimenting, while prioritising self care and loving kindness. Here is where yoga can be so profoundly helpful, grounding, and supportive to a woman as she transitions and finds her feet. I love the idea that as we begin of our pregnancy journey we start a process of spiralling inward, like walking an inner labyrinth to the centre of our being, connecting and listening to our inner voice, intuition and heart as we breath and move together with the precious life growing inside us. Then as we emerge from the experience of birth, we are presented with a new and unrecognisable landscape and begin a process of unravelling from the centre, trusting and embracing the change as we navigate our way out of the labyrinth. There is great strength and wisdom that comes when we trust ourselves, when we celebrate our efforts and share with others. 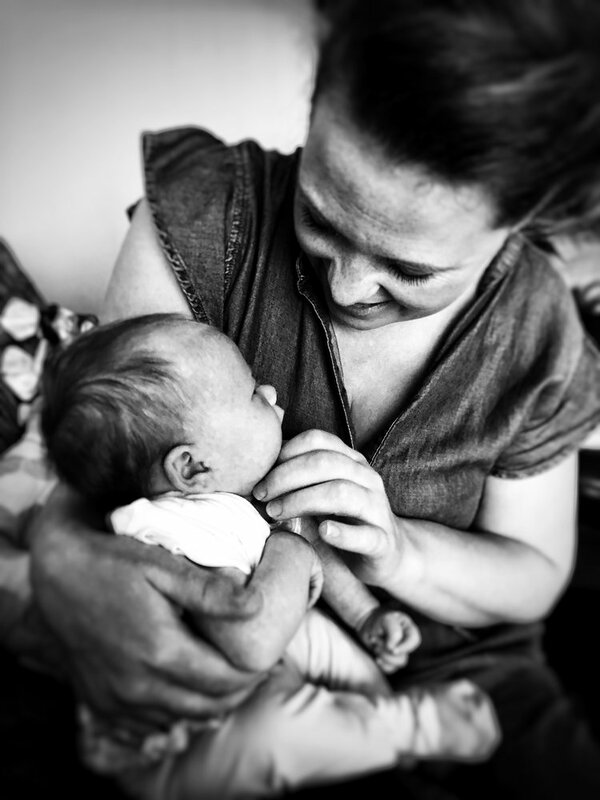 What does early post natal practice look like? The awesome Uma Dinsmore demonstrating Sonic Massage techniques to soothe mum and baby, 2018. So I know yoga is sort of hailed as a saviour for everything. And while I may be inclined to believe this, whats important here is that your yoga practice post birth and in the first year as a mother, needs to be the right yoga for that time and space. While in prenatal yoga there is an emphasis on opening and expanding, in the post natal period after birth the focus is on movement to strengthen the legs, to stabilise, restore and help nourish the core of our body. This is an amazing time to really expand our ideas around what yoga practice is. To listen, adapt and evolve the practice mindfully for the moment you are practising. INTERNAL PRACTICE – cultivate inner strength. connect to your body in this new time and space by really listening to your breath, to feeling rather than thinking or focusing on the external shapes you are making with your body. This is where the deep healing work begins, where postural integrity, pelvic floor restoration and deep stabilisation and strength will be cultivated. FIND YOUR FEET – How you stand literally affects the position of your pelvic floor. Develop postural awareness by connecting with your feet & the ground to build a functional, responsive relationship. This is where in combination with breath work the deep restoration of the pelvic floor begins. BREATH IS BOSS – This really is the key to connecting and building awareness of the inner landscape of your body in this new phase. The breath can be both restorative and Energising. The Healing Yogic Breath is one of the most powerful ways to connect with your pelvic floor and begin to restore elasticity. Become familiar with the healing breath by drawing the belly in & pelvic floor up on the exhale. Then begin to use with movement and sound. Remember pelvic floor mobility involves a balance of engaging and releasing the muscles. TWISTS – Help to detoxify, stimulate and stoke digestive fire which is naturally sluggish post birth. They are revitalising when combined with breath work and deeply nourishing helping to restore balance and equilibrium through the spine. Notably they help to re-knit oblique abdominals & restore distasis recti, rebuilding structural support. HEART OPENERS –Chest opening poses with a focus on breath to alleviate upper back and shoulder tension from feeding/carrying/ or weakened abdominals. They help to energise the body, and over time build strength and stamina with the breath. RESTORATIVE POSES – these are the most valuable practices during the early post natal period and during times of exhaustion or low energy. DEEP RELAXATION – This is so important. The power of even 5 or 10 minutes of deep relaxation can have the same nourishing effects as 4 hours of deep sleep. Use of sound practice (nada yoga) can really help especially if you are finding it hard to switch off. Take your time to get really comfortable, use props, bolster under knees if your lower back is sore. A cushion under your head. Turn off any devices, cover yourself with a blanket. WIDE STANCES - wide legged poses are not good in the immediate post natal period and should be avoided. Alignment changes can cause discomfort to destabilised pelvic joints & knees. Especially when breast feeding the ligaments and therefore joints are more vulnerable due to relaxin in the body. DONT CHASE THE BURN - Chill Winston! Fast, strenuous movement is not good at this time especially in the first 6 months post birth . Try to avoid ‘the ‘bums & tums’ style asana practice – ligaments can take up to 6 months to restore to pre-pregnancy tone.SO GO GENTLY. BACK /BELLY STRESS - Repeat after me… ‘NO sit ups!’ This action only exasperates postural hunch. Your body has gone through a monumental transformation in the process of growing, birthing and now nurturing a baby. Post Caesarean avoid asana or breathwork that strains abdominals. INVERSIONS - Especially in the immediate post natal period and until Lochia (bleeding) has ceased. Then time is your friend, build up slowly, starting with Partial or supported inversions to encourage pelvic floor engagement. When can I start Post Natal Yoga? Most Women will start between 8 and 12 weeks but the importance here is that you feel ready and comfortable. Try to find a teacher you connect with and speak with them first. What to expect from YesYoga’s Mum and Baby Classes? My aim is to create a space where you and your baba feel welcome, exactly AS YOU ARE. If you come in your pijamas - perfect. If you come in funky zebra leggings, or jogging bottoms on inside out - wonderful. Maybe you feel frantic, teary, tired, hyper, excited, apprehensive, flat…. well the good news is you might feel one or all of these at some point over the course of your block and I welcome you with open arms, to come have a hug, share and do what ever serves you for that hour. The intention of my Post Natal yoga classes is to nourish mama AND baba in an integrated way. You can join in, rest, feed, change a nappy, sleep or just be in the space with us. To NURTURE, STABILISE, RESTORE, AND REVITALISE in that order. 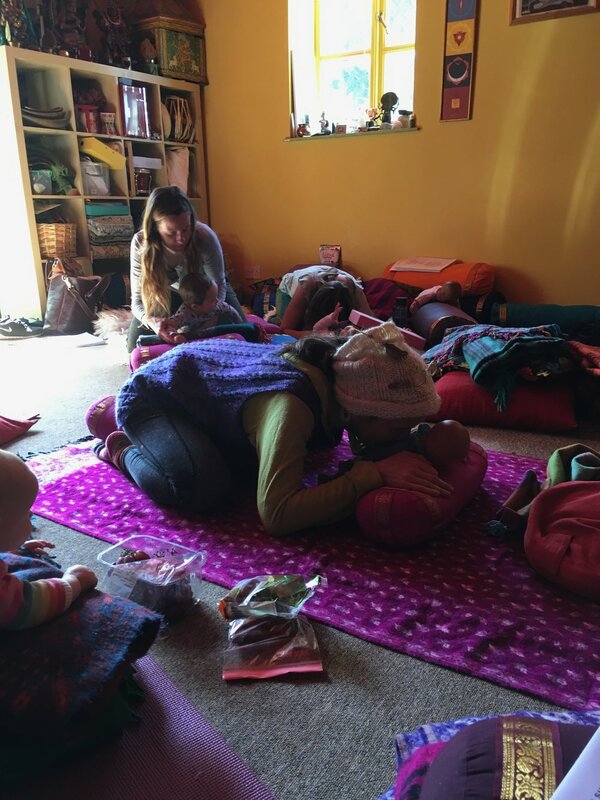 In these classes you and baby will explore breath work, yoga poses, movement, song, sound practice, relaxation and massage to help cultivate self awareness and encourage bonding and communication with your baby. Working from the inside out, using integrated movement, breath and sound so you can find stability and over time, build a new found and deeply anchored strength and vitality. So come join us: laugh, cry, have fun and feel the power and magic that is created from a circle of women sharing together with acceptance and love. Truly great things happen when women are together! YesYoga Mum and Baby Class - Enjoying some post class chats with tea, chocolate and some self care treats.